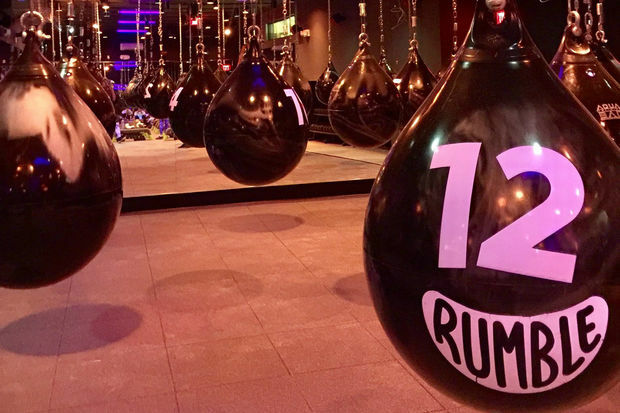 Rumble plans to open its Upper East Side gym later this year. A boxing gym that counts Sylvester Stallone and Justin Bieber as investors is planning to open a location on Third Avenue by the end of the year, according to the company and reports. Rumble, which has a location in Chelsea and is planning another in NoHo this summer, just signed a lease for 1495 Third Ave., between East 84th and 85th streets, The Real Deal reported. Rumble will take over the entire five-story building, which used to house S Cavallo Antiques. SMA Equities bought the building last year for $18.2 million, city records show. The new gym, which opened its first location in Chelsea earlier this year, specializes in boxing-inspired group fitness classes set to hip-hop and mood lighting, Rumble's website says. The gym's punching bags are actually filled with water. The gym's 10-year lease clocks in at about $1 million per year, Rumble spokeswoman Samantha Wenig said. She explained that the company chose the Upper East Side for its next location because the area's demographic fits well with Rumble's core customer. Noah Neiman, who is a former master trainer at Barry's Bootcamp and a cast member of Bravo's "Work Out New York," owns the company with Eugene Remm, Andy Stenzler and Anthony DiMarco. Stallone invested in the company, which the New York Post called "the most anticipated group-fitness concept since SoulCycle." Winick Realty brokered the deal.